Victor Hugo wrote, “Where no plan is laid, where the disposal of time is surrendered merely to the chance of incidence, chaos will soon reign.” Hugo was certainly right as far as custom home design is concerned. The planning stage often determines whether your custom-built home will ultimately fulfill your dreams. The following are six tips to help your designer create the perfect custom house plan for your family. Do you have or plan on having children in the coming years? Do you have aging parents? If so, you’ll need to think about accommodating close family members in many different scenarios, such as returning college students, accommodating grandchildren and grandparents, taking care of elderly parents – even accommodating extended family for holiday occasions. Likewise, if you’re hoping to transition from an office job to operating your own business out of your home, your custom home design should include an office or flexible space. Basically, when you think about the amenitites in your custom home plan, you are deciding what kind of family you’d like to become. Include features your future self will find handy. 3. Showcase and maximize the lot. Oftentimes, those who are in the market for a custom house plan already own the property where the home will be located. If you already know where your custom home will be situated, be sure to consider the topography, size and best features of the lot. For instance, if your lot overlooks a naturescape, you might choose to face the living room toward the feature so your family members can watch nature in action. Alternatively, if you have a brook or stream running though your property, you might choose to place bedrooms nearest the stream so you can enjoy the beautiful sound of running water while you sleep. 5. Consider function and flow. Light also figures into the placement of rooms in a custom home plan. As an example, if you want to enjoy natural morning light in your dining nook, it would be wise to face the nook east, where it will catch the morning sun. Meditating on the items listed above can help you create the home of your dreams. As you work with your home designer, take your time. Remember that it’s far easier to be upfront about what you do and do not like than it will be to remodel your custom home later. 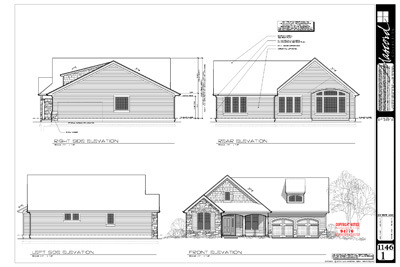 Note: The home shown above is The Godfrey House Plan 1146.